As his highly-anticipated Easter Sunday Service at Coachella took place, Kanye West took up the opportunity to debut a new “Sunday Service” capsule for the YEEZY brands. The new collection was on full display at the Empire Polo Club in Indio Sunday evening and is now made available online for mass consumption. The new capsule includes a crewneck in a tie-dye design that reads “HOLY SPIRIT. Other pieces include a cotton poncho, a short-sleeved t-shirt that reads “TRUST GOD,” matching sweatpants and even “Jesus Walks” socks. The pieces range from $50 USD to $225 USD and according to brief clips captured on festival grounds, Kanye fans were not shying away from such prices at all, nearly cleaning out the YEEZY merch setup. This week’s Sunday Service was a star-studded affair that saw the likes Teyana Taylor, Chance The Rapper, Kid Cudi, and DMX all joining ‘Ye as he delivered on a special Resurrection Sunday edition his running series. Kanye also took the chance to debut his new ‘Water” track, a possible teaser leading into his forthcoming Yandhi album. The majority the performance was a run through his existing catalog, including renditions “Jesus Walks” and other performances similar to the ones that we’ve seen through circulating clips in weeks past. Kanye West made dad shoes cool back in 2017 when he revealed the Yeezy Boost 700 “Wave Runner” to the world. While sneakerheads looked at the shoe with some confusion, likening it to some kind Walmart discount rack sneaker, people eventually came around and a trend was born. 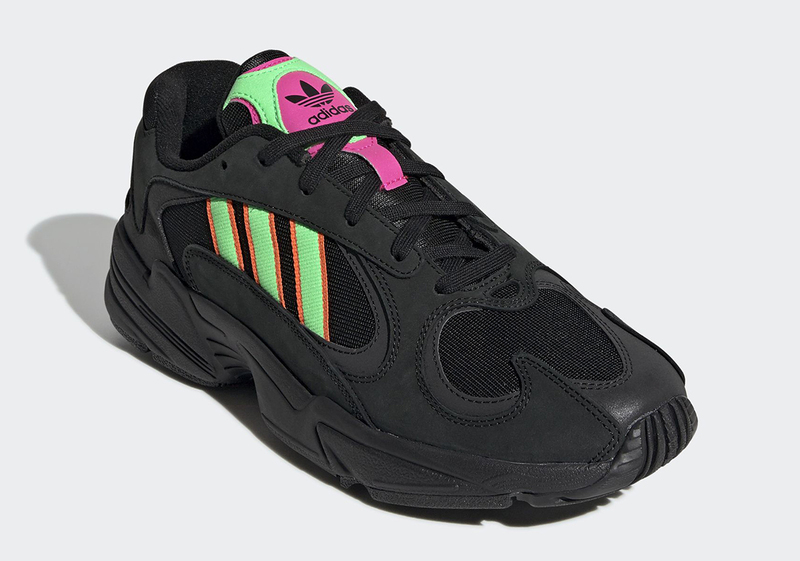 Soon afterward, every single shoe and high fashion company had their designers crank out their own takes on chunky runners. Some shoes were better than others but the trend has survived all the same. 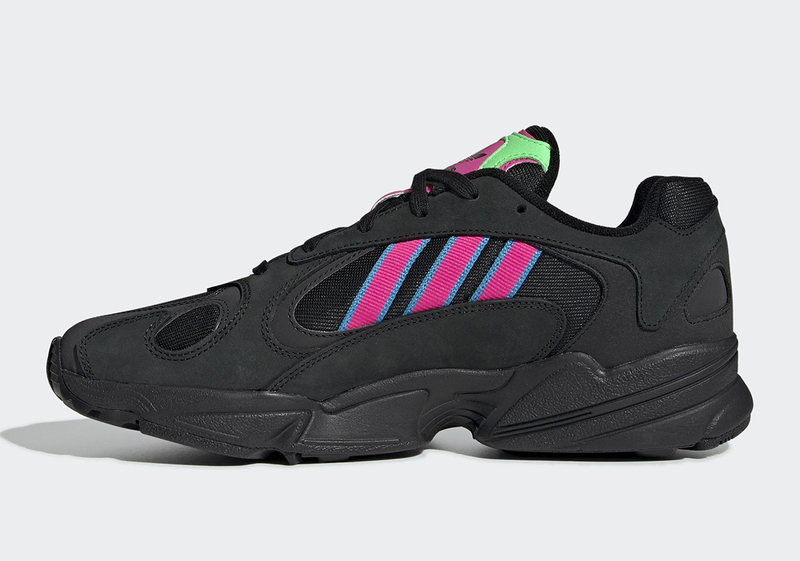 With Adidas being a Kanye collaborator, the brand attempted their own dad shoes, one which is the Adidas Yung-1. 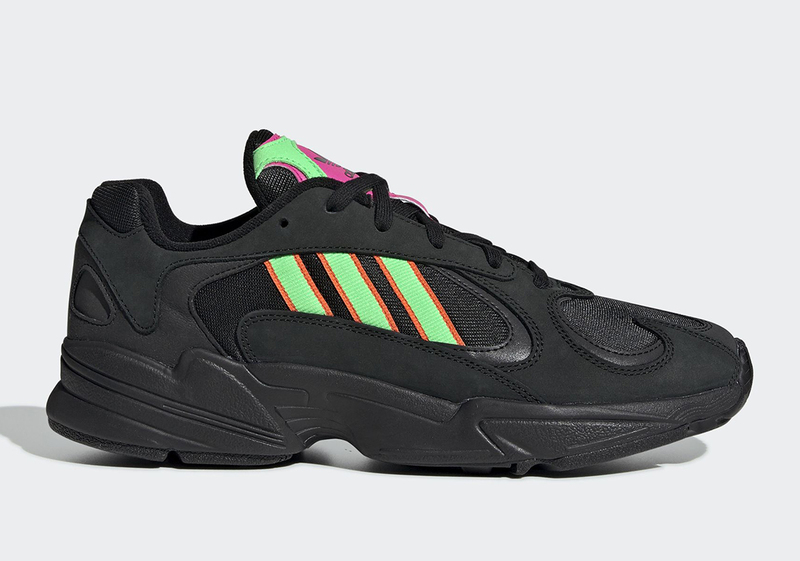 There have been a few colorways the shoe so far and with Spring here and Summer approaching, the brand with three stripes has a new model in store. 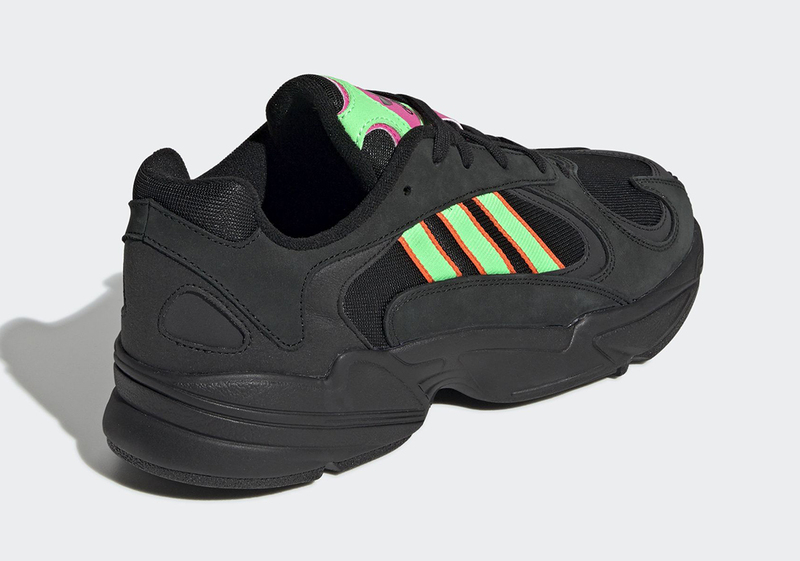 This one is interesting as it sports an all-black upper, while each side has neon stripes. 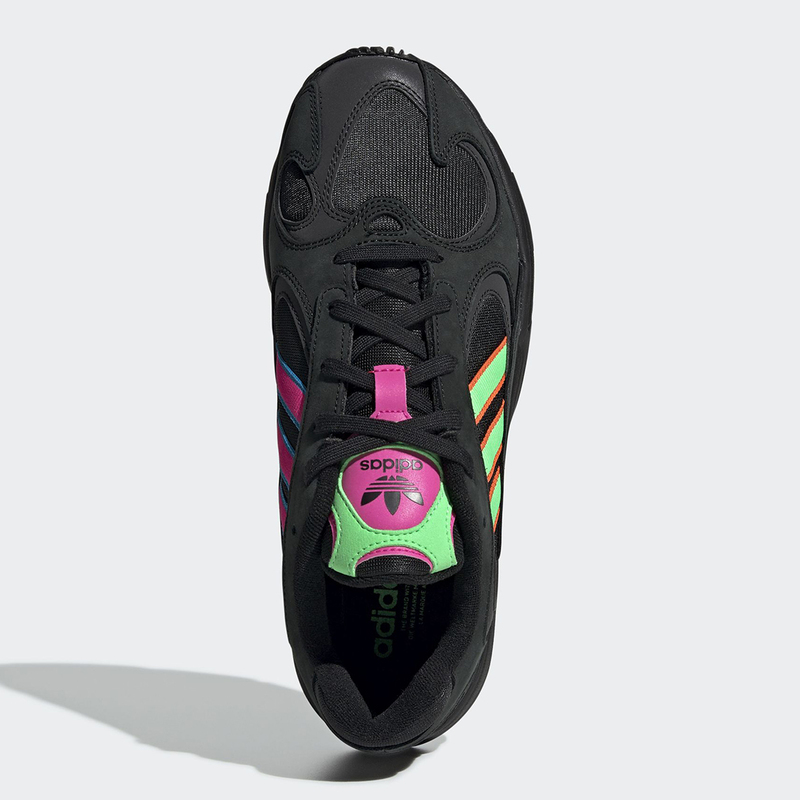 For instance, the outside the shoe has green stripes with orange outlines, while the inside has pink stripes with blue outlines. Adding to the neon aesthetics is a pink and green tongue. The most anticipated album release for this year is arguably Kanye West‘s Yandhi. After initially preparing the project for a release on Black Friday, the Chicago-bred artist ended up pushing it back indefinitely. Yandhi still does not have a release date but brief information has been leaking out about it. Several weeks ago, one Ye’s engineers spoke about a collaboration that Kanye has with Nicki Minaj called “New Body” in an interview. After that information was revealed, the song was actually teased on an episode Keeping Up With The Kardashians. Then, an unrelated track featuring Bon Iver and Santigold leaked online, which appears to have been recorded during the Yandhi sessions. French Montana is the latest to provide an update on the work, speaking with Zane Lowe about his own upcoming album before touching on Kanye’s project. Revealing that his album is approximately 96% finished, French Montana seemed excited to speak about one song he has with Post Malone and Cardi B, two the biggest superstars in the game right now. He says that the album, which remains untitled, is his best work to date. Somehow, the conversation shifted to Kanye West, who the Coke Boys leader says is making some “special” vibes right now. French Montana isn’t the first person to speak so highly Ye’s upcoming album. Those who have heard snippets are generally impressed. The Grammy-winning recording engineer and mixer has worked closely with Kanye West and crafted a number of hits. ‘New Slaves’, ‘Black Skinhead’, and ‘Ultralight Beam’ all feature Goldstein’s talents. But that’s just one of several notable superstars with whom Goldstein has collaborated. Later, Goldstein worked with Arcade Fire to record The Suburbs, which won Album of the Year at the 2011 Grammys. Columbia Records CEO recently promoted Goldstein to Senior Vice President of A&R. Before that, he spent eight years as a producer, A&R, engineer and touring audio director for West and his G.O.O.D. Music label. Concord Music’s head of creative/A&R Jeremy Yohai says his team is thrilled to be representing Noah. Psymun currently has 29 tracks available for listening on SoundCloud, including a playlist of collaborations with other artists. When it comes to medicating himself for bipolar, Kim detailed how it’s simply not an option for him since it throws f his creative process. “It just changes who he is. Traveling a lot does set it f, so he doesn’t travel as much as he used to,” Kim added. When it comes to Kanye being “in the middle a bipolar episode” she detailed how she does everything she can to diffuse the situation and help make things calmer. Before his line with Nike and Adidas, Kanye West created his very own streetwear brand called Pastelle. At the forefront this brand was the gorgeous varsity jacket above which was different shades blue mixed with yellow and red highlights. Unfortunately, Pastelle never actually came to fruition. None the pieces were released to the public, which left Ye stans wondering “what happened.” All that was left were some samples which only a select few were able to get their hands on. One those samples was for a pair shoes that were supposed to release in the Fall 2010. The pair ended up in the hands model Gio Mitchell, who is now selling them for $5000, according to Complex. The shoe is a one one sample that looks a bit like a Nike Vandal Low. Based on the pictures, the shoes are fairly used and dirty. There is discoloration towards the back, which muddies up the creamy beige upper. These kicks come with white laces and a white velcro strap that stretches across the tongue. 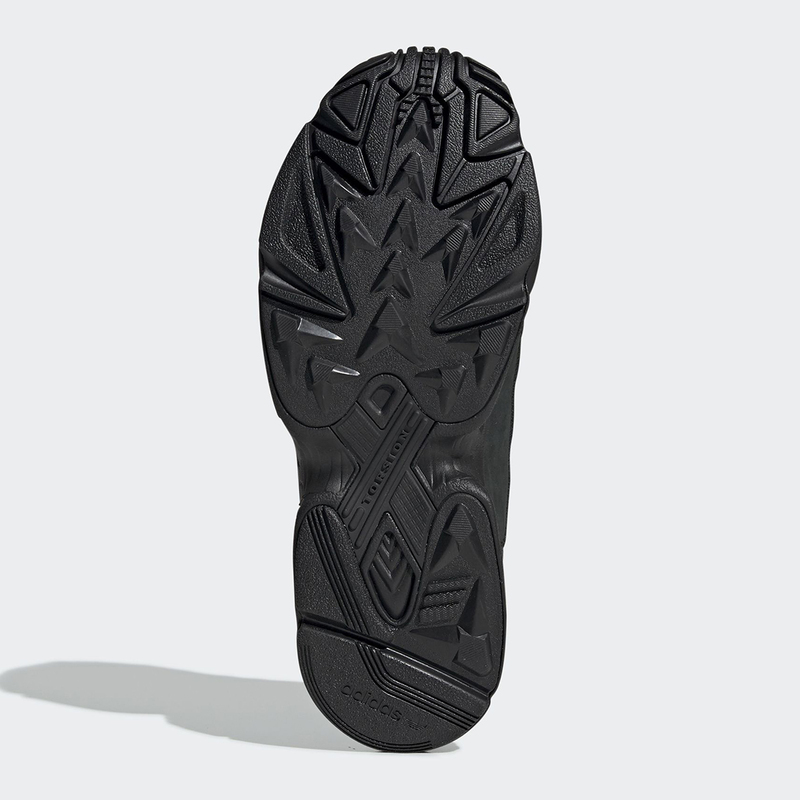 If you’re looking to cop these and shell out the $5000 necessary, you can buy them right here.